During the 2011 edition of the Caribbean 1500 cruising rally, nine yachts of the fleet of 62 broke off after crossing the Gulf Stream and sailed toward Green Turtle Cay in the Abacos. 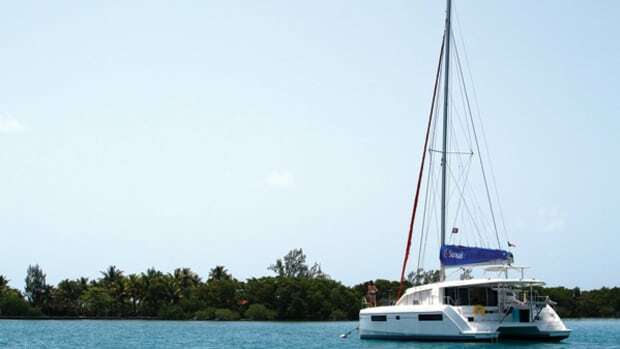 During the 2011 edition of the Caribbean 1500 cruising rally, nine yachts of the fleet of 62 broke off after crossing the Gulf Stream and sailed toward Green Turtle Cay in the Abacos. 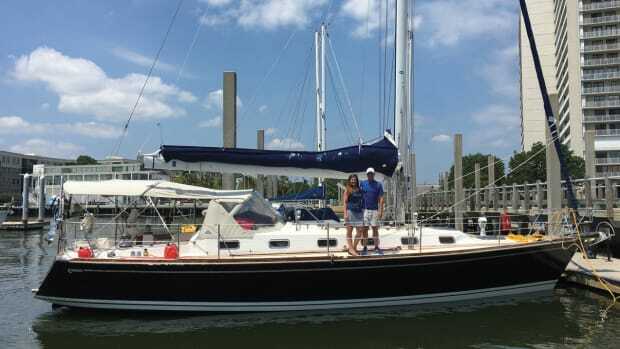 Bentana, a 41-foot Gulfstar ketch, was one of the slower boats in the fleet, but owners Stephen Sellinger and Judy Long were one of the more experienced crews. They were also veteran Bahamas cruisers and knew better than to run a reef break at night. 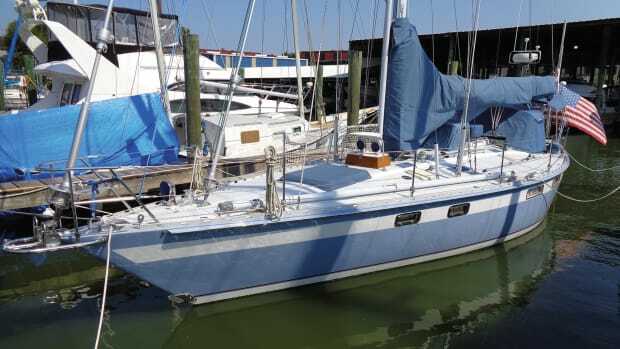 Instead of running through the reef, Stephen and Judy headed for deeper water and stayed 15 miles offshore, hove-to for the night under a roller-reefed genoa and mizzen. It was a difficult decision, as one of their crewmembers missed a flight the next day, which “cost him a lot of bucks,” Judy said. But it was the epitome of good seamanship. Rather than risk their boat, their dreams and their lives in the narrow inlet, the crew of Bentana waited for dawn in comfort, using a technique as old as sailing itself. The goal when heaving-to is to create balance between the wind, sails and rudder that effectively stalls the boat at a roughly 45-degree angle to the waves. With the bow absorbing the brunt of the wave power and the boat in a relatively stable position, life aboard becomes safer and more comfortable than in almost any other attitude. Some people also believe that as the boat slowly drifts downwind, a slick of turbulent water created by the keel has an additional dampening effect on the breaking waves to windward, making the situation more comfortable still.  Finding the right balance­—where a boat will sit 40 to 50 degrees off the wind, riding waves without a care, and not giving up too much ground to leeward—depends on a boat’s sail plan, hull design, displacement, keel and rudder design and sea state. Contrary to popular belief, modern fin-keeled yachts will, in fact, heave-to, although forereaching is sometimes an easier—though not necessarily better—option (see sidebar). To heave-to, first set your sails close-hauled and reef according to the conditions. As you do so, be aware that if you have too much sail up, you’ll risk getting knocked down; too little sail, and it won’t work. Once you’re sailing along comfortably close-hauled, tack the boat, but don’t touch the jib sheets. Instead, as the bow passes through the wind, let the jib back while the mainsail falls onto the new tack with its traveler centered. After the main fills, put the helm down again to try to turn back into the wind with the jib aback. At this point, you’ll probably find that the bow has fallen off some 60 degrees or so from the wind. Play the helm to try to get closer to 40 degrees, being careful not to tack again. If the boat won’t come up at all, you’ll need to reduce sail area forward or maybe even hand the jib entirely, depending on the boat and the conditions. Again, the goal is to get the bow 40 to 50 degrees off the wind, although you can expect the angle to oscillate as the wind and waves act on the boat’s hull. 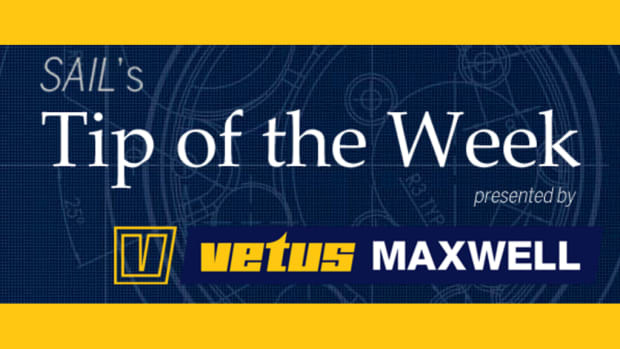 If the opposite occurs, and the boat wants to head up and tack on its own, you will need to reduce sail area aft by reefing or handing the main. You can also try adjusting the main sheet to keep the boat from rounding up, similar to the way you might play the main in blustery conditions to control weather helm. Again, contrary to popular belief, every boat can be coaxed into a hove-to posture. It’s only a matter of tweaking and practice. Make one change at a time and keep a log of what you’re doing so you will know what worked and what didn’t. As you do so, be sure to monitor for chafe. Genoas usually need to be rolled in a few turns so the clew doesn’t rub on the shrouds or spreaders. You may need chafing gear on the loaded jib sheet if it ends up plastered against the windward shrouds. Ideally, you should re-run the sheet inside or between the shrouds for a fair lead and avoid chafe altogether. Many people associate heaving-to with heavy weather and rightfully see it as a tactic for handling storms at sea. But it isn’t only a heavy-weather technique. In fact, in my experience­—which includes some 25,000 bluewater miles in deliveries and a transatlantic passage on my own boat—I heave-to most often for things like reefing down when singlehanding, diving on a fouled prop, waiting for daylight or just for a quick swim. One time, on a delivery from Charleston to Tortola on a 40-foot sloop, we beat our brains out sailing to windward for 13 days. The breeze was a steady 25 knots, with steep, uncomfortable seas, and one of the crew was sick nearly the entire way. We’d often heave-to so the cook (usually me) could whip up a hot meal in relative peace. Stopping the boat for an hour each afternoon for a break from beating gave us a chance to eat, clean the galley, organize the saloon and regroup a bit mentally in preparation for the next 23 hours of bashing to windward. With respect to storms, conventional wisdom teaches us that lying ahull, heaving-to and dragging warps are all sound methods for handling heavy weather. Hal Roth, in his posthumously published book, Handling Storms at Sea, describes these techniques as all being part of a continuum of methods, each one suitable in its own right depending on conditions. According to Roth, heaving-to comes after reefing in his list of techniques for handling increasingly deteriorating weather. In other words, in most cases heaving-to is appropriate in uncomfortable, as opposed to truly dangerous, conditions. In a survival storm, you’ll also need to consider setting a sea anchor, or running off streaming a drogue, or running off freely, as Bernard Moitessier did during the storm he famously experienced while sailing nonstop from Tahiti to Spain in 1966. To heave-to in heavy conditions, it is imperative that the boat be snugly reefed down. In fact, it’s typically a good idea to over-reef in anticipation of worse weather to come. 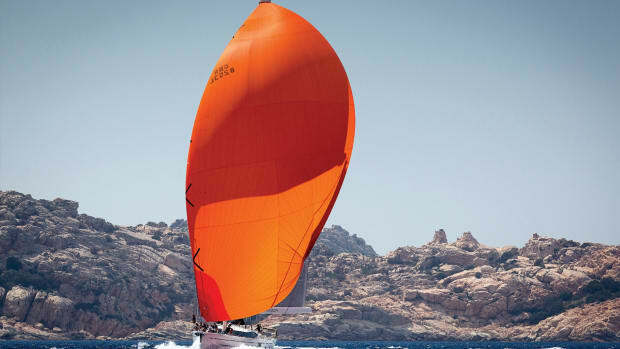 Headsail area must be carefully balanced against mainsail area, since generally speaking, moving the center of effort aft will have the best effect. Carrying two or three reefs in the main (or a furled main and set mizzen) with a staysail set on an inner forestay is arguably the best combination. For one thing, the staysail, which should not overlap the mast, can be sheeted inside the shrouds, thereby avoiding chafe. 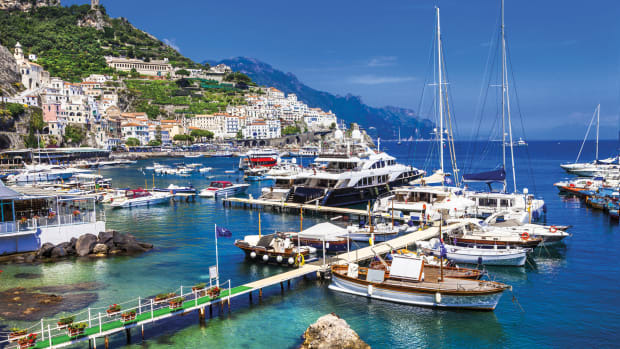 For another, if and when you need to quickly get underway again, you’ll have an easily managed sailplan all ready to go. A catamaran will indeed heave-to, though in my experience they make considerable leeway with their shallow keels. Most cruising cats have enormous full-roach mainsails, small fractional jibs and little rudders, so much tweaking is required to get them to play nicely with the waves. Reef the main straight away and back the jib, then tweak the helm until she rides comfortably. Just like a monohull, a cat should drift calmly at about 40 to 50 degrees off the wind, dramatically easing the boat’s motion, which can seem skittish and uncomfortable to the uninitiated. If everyone onboard is puking off the stern, heave-to and give everyone a swim break. Being in the water rather than on it is usually an instant cure for seasickness and more than worth the lost miles. Fore-reaching is akin to heaving-to and also depends on the boat, crew and conditions to be successful. 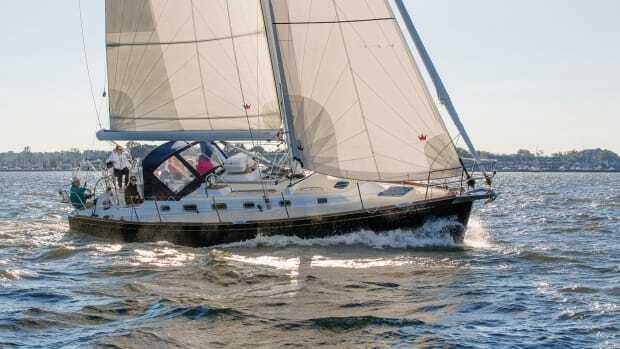 Fore-reaching essentially keeps a boat moving forward to windward at greatly reduced speed and is accomplished by sheeting the jib amidships (not quite backed) or lowering it altogether, with the mainsail sheeted in tight (and usually reefed) and the helm lashed slightly to leeward. Think of it as sailing your boat very inefficiently to windward. Often a boat that is improperly hove-to ends up fore-reaching unintentionally, hence the erroneous belief that modern boats cannot heave-to. Fore-reaching can be a better alternative to heaving-to in certain situations. In tidal areas, for example, fore-reaching can be used to slow down a boat without losing ground to an outgoing tide or current. If in bad weather your destination lies to windward, using fore-reaching as a defensive technique can keep you safe while still gaining you some ground in the direction you’re going. Fore-reaching is a more active technique than heaving-to. For example, I’ve heard of it being used during an ARC rally by a boat that wanted to stand by another disabled yacht. In this case, the standby yacht, fore-reached back and forth to windward while watching over the other boat as its crew repaired its rudder, as opposed to passively heaving-to and drifting.